Renewal by Andersen puts much time and effort into ensuring the lasting energy efficiency of the windows they produce. Each Andersen window is EnergyStar rated. Each one utilizes materials that have been specifically designed for increased energy efficiency, including our exclusive Fibrex material and High Performance™ Low-E4 glass packages. You won’t find a window company with a better understanding of our deeper dedication to energy efficient windows. The need to save money on monthly energy bills is something to which every homeowner can relate. It seem that every year the prices of gas, oil, and electricity get higher and higher and keeping a home bright and comfortable gets more and more expensive. Renewal by Andersen seeks to counteract those skyrocketing prices with advanced windows that take into account the factors that lead to energy loss or overuse. 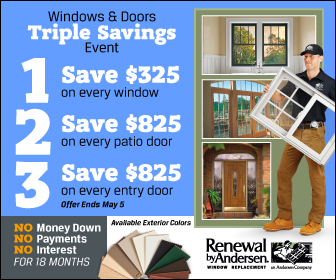 For more information on the energy efficiency properties of Renewal by Andersen windows, make a call to your leading source for energy efficient replacement windows in St. Louis – Renewal by Andersen of St. Louis.